...going on to become one of kind wearable art. This collection of striking 'green' merchandise was conceived as a creative out source of using post consumer waste, resulting in a stunning up-cycled line. Up-cycled items often have both a better quality and a higher environmental value than they had in their original state! What else makes up-cycled items so desirable? They are created with innovation and creativity! With up-cycling, an item is no longer being used for its intended purpose, but is re-purposed - given a new purpose - and along with this new purpose, it is also given an increase in value, both aesthetically and monetarily. It is worth more in its new form. "Up-cycling is designed to work in opposition to consumer culture, encouraging people to think of new and innovative ways to use things, instead of simply buying new consumer goods. It also benefits the environment by promoting reuse over discarding whenever possible." All the pieces in the Fused line have been lovingly made by hand or reworked in some way to produce the distinctive final products in these categories. Fused Clothing- a line of reworked clothing that has been altered or edited in some way giving it a new lease on life. Using my original designs the garments are altered either by silk screening images onto them or embellishing in some fashion. Each piece speaks to me & tells me how it should be transformed, there is no formula, only magic. Each item is respectfully reworked, redone & remade into a unique elements of wearable art. 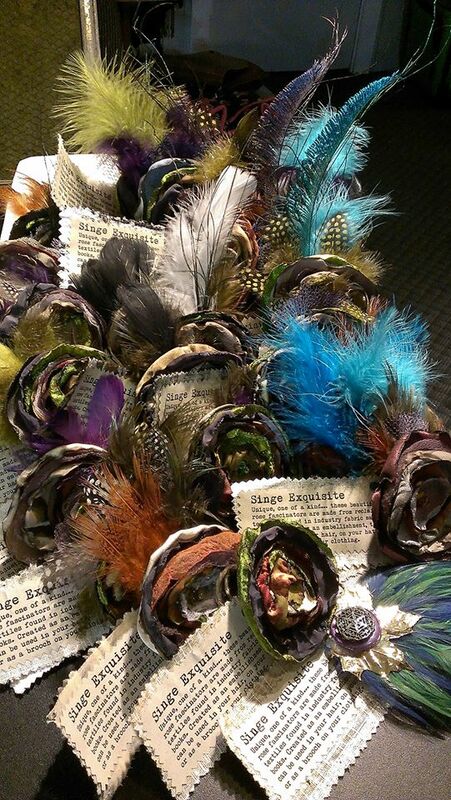 Singe Exquisite - a line of fascinators created from the incredible fabrics found in upholsterers sample books. They can be worn in the hair, on a hat or your lapel, a beautiful addition to any women's arsenal of gorgeous accessories. Tube*Bella - Jewelry with "inner" style! This product is indeed made from the inner tubes of old bicycle tires, reworked & up-cycled into beautiful post consumer merchandise. Jewelry that has "been around the block"....literally!